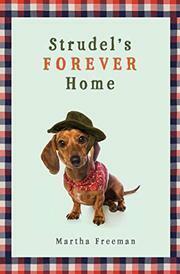 A loyal, playful, and opinionated dachshund adjusts to a new home after losing his human in an incident he cannot remember. The story is told from the point of view of the dog, named Strudel by the Philadelphia shelter that initially takes him in. At the shelter, Strudel meets a fifth-grader named Jake, who reads him adventure stories from a book called Chief, Dog of the Old West and ultimately adopts him. Jake's house is full of chaos—there’s tension between Jake and the older sister he's nicknamed "Mutanski," forgotten meals and walks, and Jake's mom's demanding, easily provoked boyfriend, Arnie—and both Strudel and the humans adapt slowly but discernibly. Meanwhile, Jake does dangerous "favors" for a neighborhood bully, and a gang of cats menaces Strudel when he's left outside during the day. The multiple plotlines keep the story moving quickly, and each—including the mystery of Strudel's separation from his original owner—is satisfyingly resolved. Strudel's perspective vacillates between true to dog nature (exchanging pee "messages" with other neighborhood dogs) and not at all: he mistakes a garden hose for a rattlesnake in part because it is green (real dogs don't perceive color that way) and, more distressingly, dislikes chocolate but suffers no apparent consequences from eating it, despite its notorious toxicity to dogs.